Duality is a real-time media performance exploring how minimalist techniques in sound and vision can allude to much broader concepts, such as the duality of the human experience. The sounds come from granular processing sounds and a custom synthesizer I built within the visual programming language Max MSP. Everything was then arranged within Reason and performed with Ableton Live. 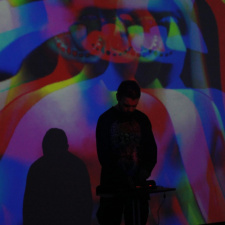 The accompanying visuals were made with Jitter, openFrameworks and VDMX. This was first performed live at Buster Mantis in London as part of my final project for my Programming for Artists II module on the MA Computational Arts Course at Goldsmiths University.